Michelle Obama saved the best for last. The first lady wore Italian designer Versace as she and her husband, president Barack Obama, played host to Italian Prime Minister Matteo Renzi, his wife and other high-profile guests on Tuesday night at their final state dinner at the White House. The rose gold chainmail gown, which featured an off-the-shoulder style, hugged her famous curves in all the right places. She put all the attention on the eye-catching style by opting for minimal makeup and a straight hairstyle. Agnese Landini, the Italian prime minister's wife, also stepped out in a sparkling gown of her own. The brunette beauty chose a strapless silver number with intricate embroidery for the special occasion. She matched the look with a shawl and clutch of the same hue. The first lady has hosted 14 state dinners since her husband became president in 2008, and the black Vera Wang mermaid dress she wore during China's visit in 2015 remains one of her most unforgettable looks. 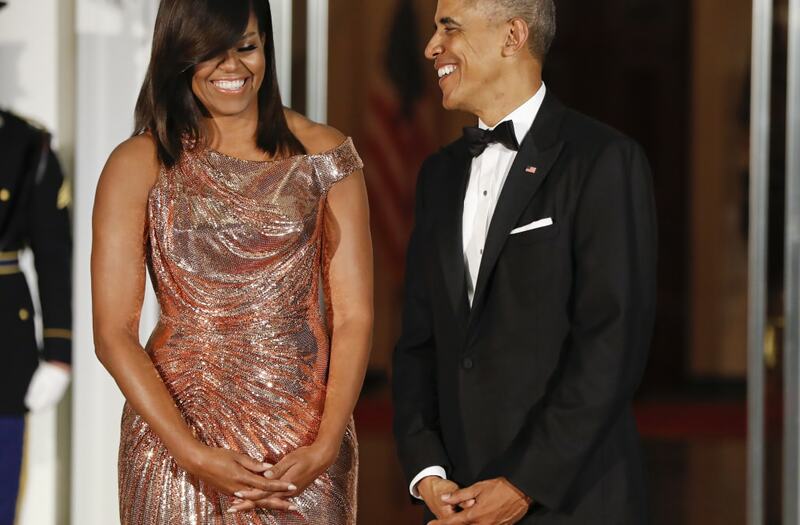 Her sparkly gown seems out of the ordinary compared to her past state dinner outfits, as she has often opted for more neutral colors such as beige, black or white with subtle pops of color. World-renowned chef Mario Batali created the mouthwatering dinner menu, featuring Obama family favorites such as velvety pasta pillows and beef tenderloin. And unbeknownst to most, Batali even used fresh vegetables and herbs from the first lady's own garden! The guest list, which was released only an hour before the event, included celebrities like comedian Jerry Seinfeld, singer Frank Ocean and chef Rachael Ray. Michelle Obama's state dinner look definitely has us feeling nostalgic about her eight years of stunning outfits. But with three months left till the Obamas move out of the White House, we can't wait to see what other impeccable looks she has up her sleeve.